I arrived in Hong Kong on 20th September 2015 and I looked forward to giving talks to thousands of school children. 21 Monday: It was going to be such fun to talk to Year 1 and Year 2 children at the Canadian International School, but when I arrived I couldn’t find my books in the library. The librarian was away and teachers said my True to Life books were so popular the children were always reading them. 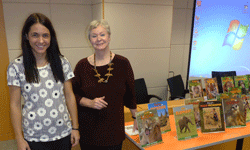 Pauline Lau of Fields came to the rescue with the series of books and children enjoyed my animal videos and learning about endangered animals. 22 Tuesday: Joli Moore, the librarian at PLK Choi Kai Yau School organised state of the art equipment to show my videos on multi screens. It was so exciting! Students asked great questions and one student was very special with his knowledge of endangered animals. 23 Wednesday: A wonderful day with Year 1 and Year 2 students at Kowloon Junior School. Thanks to Vanessa Sheppard for inviting me. 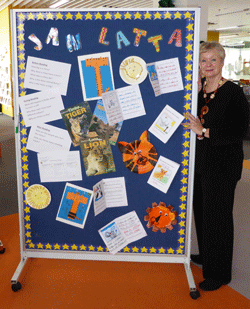 Lisa Kaye, the literary co-ordinator, organised my four presentations in their fabulous library. 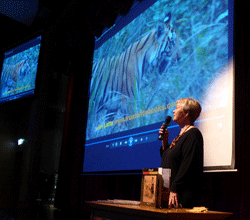 I hope I can return and talk about endangered animals to the older students on my next visit to Hong Kong. 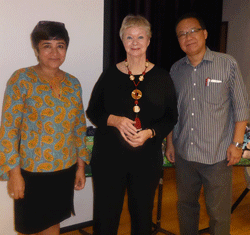 24 Thursday: It was such a thrill to talk on stage at the fabulous International Christian School Theatre. The whole school came to hear my talk at the Assembly and it was also piped into the classrooms. Then I did two workshops for Grades 4 and 5 and that was great fun. 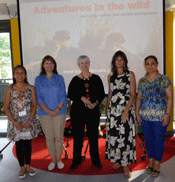 Teachers said they learnt many interesting facts about the animals as well as the students. 25 Friday: A great morning at St Stephens College Preparatory School. Founded in 1903, it is the largest secondary school in Hong Kong. During the Second World War the Japanese used it as a prisoner of war location. Eddy Kam and Rashmi Sahi organised my visit and I had the pleasure of meeting the Principal, Ms Carol Yand. 26 Saturday was a long flight from Hong Kong, with a stopover in Dubai, and then to Nairobi, Africa. It was such a relief to see my bag arrive because last year my camera and video equipment were stolen.